Build the best sales foundation, understand your market, and set strong goals by following our winning sales plan template. In order to go after the right market segments with an effective sales strategy, sales teams have to start with a solid planning foundation. With lots of tricky questions to answer and details to iron out, it can be easy to lose track of who’s responsible for finalizing pieces of the plan. Our template gives you the structure you need to make sure you’ve got each piece of the plan ready. Track everything in one place. Instead of having responsibilities, to-dos, and requests scattered in various channels, everyone can see the plan in one place and be bought in before work begins. Clarify who’s doing what by when. 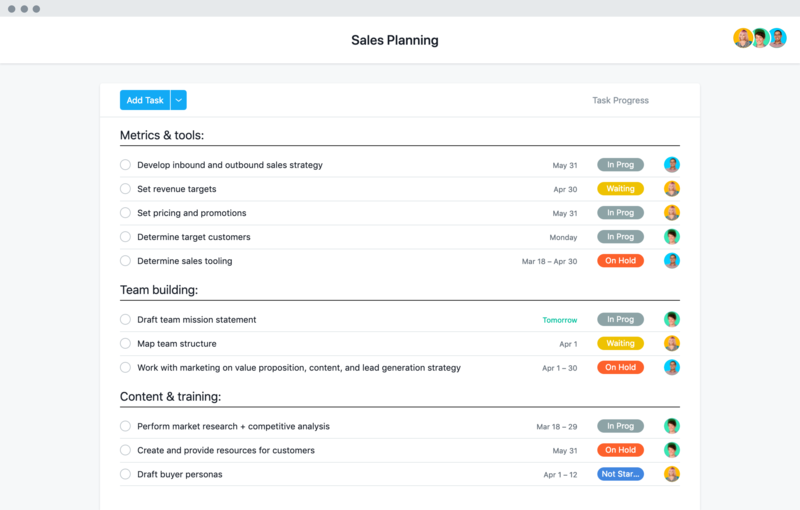 Our template makes it easy to assign tasks to teammates with clear deadlines and expectations—ultimately leading to more timely success in creating your sales plan. Make sure work starts at the right time with dependencies. Certain pieces of a sales plan—like market research and outreach plans—need to be tackled first. Ensure your teammates don’t get off schedule by using task dependencies. Know how your sales plan is progressing. Team leads can check in on the plan to see where high priorities stand, and where work might be blocked. They can also provide weekly status updates from your Asana project so other stakeholders can have visibility into progress. See your accounts at a glance and track to-dos to keep them on track with our guide. Connect with other sales teams using Asana and start your own conversations. Improve your sales process and maintain relationships by using Asana and Salesforce together. CRMs keep deals and customer details organized but only Asana Premium helps you plan and manage your sales department initiatives. Start a free trial today.